Layers of Love is very happy to announce that we have completed another goal! We have received enough fleece blanket donations in order to complete our goal of 25 blankets to deliver to the Lehigh Valley Health Network. Thank you to the many generous donations from both individuals and community groups who have contributed to help us reach our goal. We realize that without the help of YOU we would not be able to continually do what we are doing. It is our goal that as long as there is a patient who is going through chemotherapy treatment we want to be able to provide comfort and warmth with a fleece blanket for each one. Although this is another goal we have completed there are still many other goals we are still striving for. We are still actively collecting child sized fleece blankets for the wonderful children’s charity Friends Like Us. They are pairing up the blankets in their Chemo Bear packages that they give to children who have recently been diagnosed with cancer. 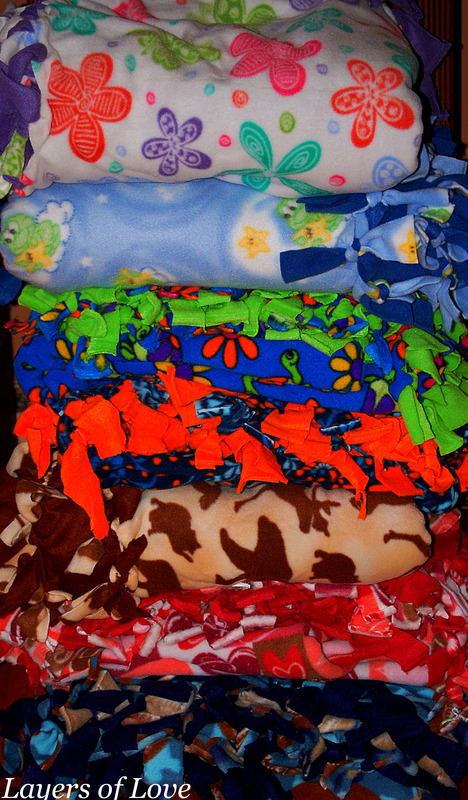 We are also still collecting brand new fleece blankets for adults who are going through chemotherapy treatment. Since we have started Layers of Love we have been receiving, in increasing numbers, emails from many people who either know a friend or family member who is undergoing chemotherapy and have requested blankets. We are very proud to say we have never turned down one of these requests. Thanks to your support we are still providing these blankets when requested and will continue to do so. *If you or your community group or organization is interested in donating to Layers of Love please let us know by leaving a comment below or contacting us through our email: donations@layersoflove.net We have worked with many community groups and organizations, from providing you with enough scissors, to showing you how easy it is to put blankets together, we will help you to get your group on their way to making blankets! This entry was posted in Donations and tagged blankets, cancer, chemotherapy, completed, Donations, fleece, goal, thank you. Bookmark the permalink.